A man and his German Shepherd from McKinney, Texas, have a lot to be thankful for this weekend. When they became trapped in chest-deep floodwaters under a bridge around 4 a.m. Friday, the man called 911 on his cell phone, hoisted his big dog up onto his shoulders and waited for help to arrive. The McKinney Fire Department managed to pinpoint the man’s location by ‘pinging’ his cell phone off nearby towers. Professional photographer Michael O’Keefe, founder of First Response Photography, was also on the scene. Using what spokeswoman Stacie Durham told the McKinney Courier-Gazette was a long-angle rescue, firefighters maneuvered the ladder over the water from the fire engine parked on the bridge. Swift-water rescuers were lowered to the man and his dog, who were lifted to safety. “It was a pretty lengthy rescue process,” Durham said. Soon after the man and dog were on dry land, the German Shepherd showed his appreciation to his lifesaver, as you can see in the photo above. 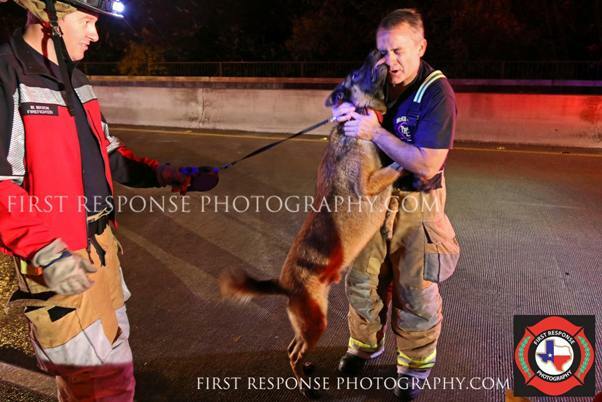 On the First Response Photography Facebook page yesterday, O’Keefe wrote, “We have received numerous messages and calls from all over the globe, people wanting to share their appreciation to the McKinney First Responders that rescued a man and his dog from the flood waters early Friday morning.